We can’t wait for the Lambeth Country Show on Saturday 18th and Sunday 19th July. We’re going to have so much fun! 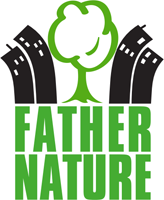 We’re delighted to have joined together with Natural Thinkers, experts in ‘natural’ play as well as Lambeth Family Learning to make one giant stand that will provide a bundle of FREE kid friendly family activities for the whole weekend in the brand new Eco Zone. Parents and carers – feel free to join in or just take some time out under the shade of our gazebo and have a glass of our delicious homemade elderflower cordial. 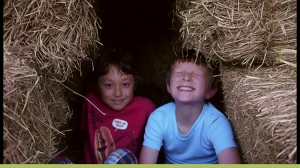 * Come help us build a hay bale castle… or will it be an igloo or a maze? You decide! Where to find us? We’ll be at pitch FZ16 in the brand new Eco Zone near the Farm Zone in Brockwell Park from 12 noon both days. 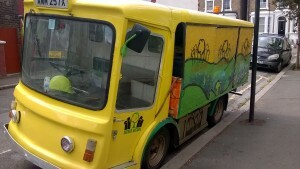 Just look out for the huge pile of hay bales and the bright yellow and green Father Nature milk float – you can’t miss us!